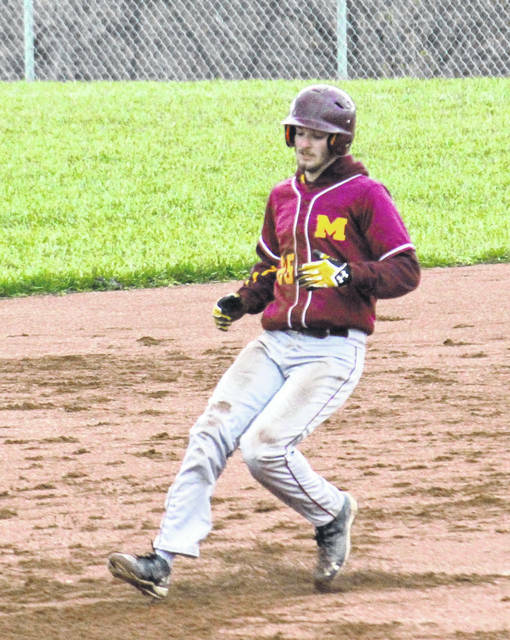 Meigs senior Bryce Swatzel pulls safely into second base during the Marauders’ TVC Ohio victory over River Valley on April 4 in Rocksprings, Ohio. Shining in the classroom and on the diamond. The Ohio High School Baseball Coaches Association has released the 2018 All-Ohio Academic team, featuring a pair of Marauders. Requirements to be on the senior-only list include at least a 3.5 grade-point-average, as well as a 25-or-better on the ACT. A total of 36 players from the Southeast District were selected, with catcher Zach Helton and designated hitter Bryce Swatzel representing Meigs.